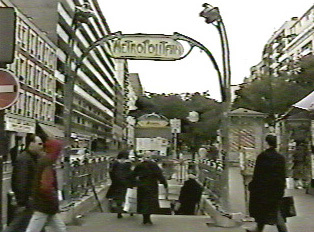 Larger cities such as Paris have a subway system. Otherwise, one uses buses, trolleys and trains. Buses run every fifteen minutes and are clean and efficient. Bus tickets are sold on the bus. To ride the trolley, one must purchase a ticket from a machine near the stop and validate the ticket in the validating machine inside the trolley. The train is generally used to travel between cities; within the city one generally uses the bus or trolley. The trains have extensive routes throughout all of France, with sleeper cars for those taking longer journeys. Tickets are purchased at the station, and one can purchase refreshments either at the station or, for a higher price, on the train.